Fluids generated, like blood from meat or water dripping from washed vegetables, funnels down the centre of the GravityTray into channels and in a separate bottom chamber where it is trapped. This eliminates the need for and cost of an absorber pad—and keeps the unsightly and potentially damaging liquid away from the food, even if the tray is turned upside down, says the company. Traditional absorption pads—containing blood from a cut of fresh meat in a tray, for example—can harbour bacteria and create a food safety danger. “When turning the tray on its side or upside down, the outlet of the funnel is positioned above the liquid in the bottom. This ‘funnel outlet’ is pointing above this liquid like a chimney,” he adds. 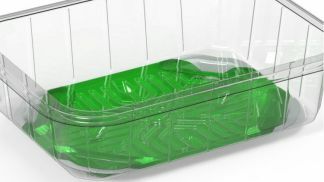 The tray can be made of polypropylene or polyethylene, and is filled and sealed on existing packaging systems with typical lidding film. According to the company, the tray’s material weight is the same as current trays, as well as its top-load strength. A foil sheet formed and sealed underneath the tray provides branding and merchandising, effectively concealing the captured liquid.